Guys, I’d love for today’s post to be more of a discussion. I don’t know much about Clover and I’d love for you to chime in. This particular brick-and-mortar location developed from a wheels-and-engine business. Am I right about that? Clover was originally a food truck, I take it, and there are a herd of them now in the Cambridge/Boston area. They serve all (or mainly?) vegetarian food. Food trucks are on fire right now. And to see that a nomadic business can settle in and put down roots seems pretty cool. I mean, that’s how “civilization” started. (Hey, I used air quotes, and I’m not saying that today’s nomadic societies aren’t civilized.) I would have loved to try the Clover food truck experience first. My friend Deb, on the other hand, had tried the food truck first. Raved about it. Loved the food. And when she saw that I’m eating “veganish” she suggested we meet up with friend Sonya to try out the steady digs. The electronic “sandwich boards” as you walk in: Interesting technology there. It’s a vertical flat screen. Rather than erasing and re-writing a sign, they erase and rewrite something on their computer in the back (?) and reload or whatever. What’s the point? Not sure, except when you don’t need two “menus,” you can switch one of the screens to whatever it is you want. When we walked in both boards were menus. When we walked out, one was a menu, one was Clover’s website/blog. I ordered the Chickpea Fritter – aka, falafel – in a pita. It came highly recommended by Deb. It was awesome. 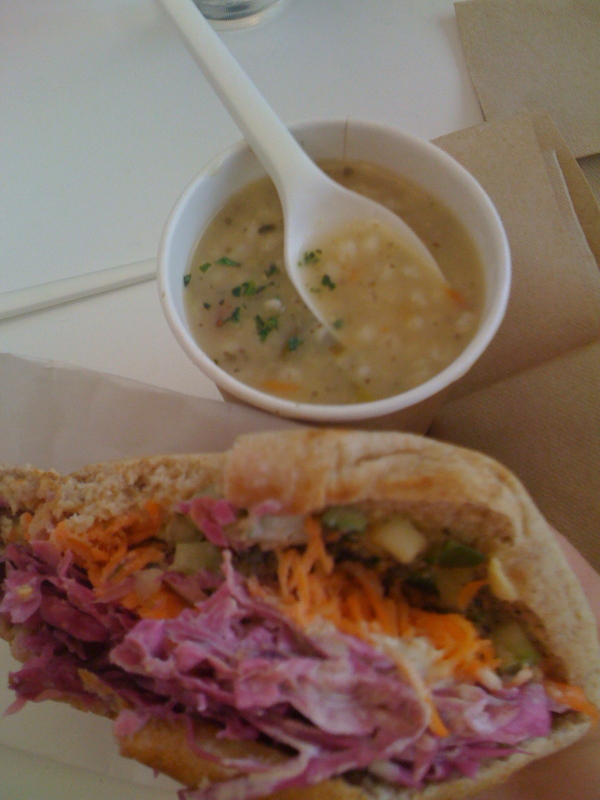 The slaw was tasty, as was whatever Mediterranean-esque sauce that was in it. The falafel was nicely done, still moist inside. There were a lot of things inside my pita I couldn’t quite pinpoint, but that was okay because I loved it all. Especially the pickle slices. BUT, folks, DO NOT put a falafel ball right on top of the stuffed pita. Mine did an “On Top of Old Smokey” thing and rolled onto the floor. Sad face. Deb ordered the Egg & Eggplant pita. She loved that, too. Looked good. Can you get that without the egg? Next time. Rosemary fries for the three of us. Yum. Dude, they were awesome. I love that “city water” was on the menu and listed as $0. Deb was a bit disappointed that the restaurant menu was the same as the food truck. I think she was expecting a few other choices. If you’re going to serve pitas that are hefty and stuffed, maybe provide “holding docks” at each table—things like the U-shaped diner napkin holders. So, when you’re settling down into your seat, taking off your coat, etc., this thing can hold your pita without the food falling out (and rolling onto the floor). Just a thought. The space needs a living wall either in the front windows above, or on that back wall. I know there’s those supports on the back wall and it looks like there’s grape ivy being training on them. Long, slow process. Clover may be looking into this—but, I do know a little something about living walls and know people in the biz. It doesn’t have to be complicated. AND, how cool would it be if they grew their own herbs and salad greens right there on location? It’s possible. Plus, as you may not know, plants “clean” the air, provide oxygen, and also help regulate temperature. Like I said, I know a little somethin’ somethin’ ’bout the topic. Dainty Rates: 3 out of 5 Dots. Where’s Dainty been these last few days? Not blogging, obviously. It think it’s a misdemeanor to blog while in the big warm world of South Beach. We jetted away last week to find some relief from this lagging winter. While down there, I had to make good on a bet. Thanks to the Pittsburgh Steelers, I owed Jennifer a meal at the Fountainebleau Hotel – a fabulous haven for the young and rich who want to be seen. We just wanted to check out the glitz. After a little research, we found that Scott Conant had a restaurant in the compound call Scarpetta. Scott Conant – he’s one of the judges on Chopped, the one who practically had someone cuffed and thrown into jail for including cheese with a fish dish, apparently a big Italian food no-no. You don’t know me if you don’t know how I feel about such restrictions. Wanting to learn more about the man’s culinary viewpoint—and secretly wanting to put cheese on fish while on the guy’s turf—we decided that Scarpetta would be it. The restaurant – dimly lit, private, modernly comfortable. The front-of-house girls – Jennifer even called them vacuous to their faces and they giggled. The waitstaff – well-trained. Although our guy looked vaguely like a thin Charlie Sheen. We were seated on the veranda, which typically has ocean and pool views but was enclosed due to high winds. Maybe our seating had something to do with 50 Cent and his entourage dining inside. Who knows. Anyway … I’m not going to tell you about our entire meal – I’m sure there are enough reviews out there for your reading pleasure. You can assume it was great. If it wasn’t, I’d write all about it. What I’m going to tell you about is my appetizer, which – and I’m not kidding – may be the best thing I’ve ever eaten in my life. Burrata atop heirloom tomatoes. I will forever remember this dish, and here’s why. Now, about that burrata – this was a mozzarella that must have just begun to form and was immediately served to us, it was that fresh. And delicate. So, so delicate. Cutting into the burrata released a small dose of warm cream, coating the ripe yet firm tomato. Someone’s Italian grandmother was in the back making this. I just know it. So, there was this small bite of rich and creamy cheese contrasting with the bright light tang and texture of the thick slab of tomato. The taste and texture could make me believe angels exist, it was that good. I had wanted to save a small corner of the burrata to put on my turbot entree, but I just could not leave a drop of it for later. I must learn to make burrata. Dainty Rates: The burrata – off the charts. I’m a HUGE fan of Snickers from back in the day. Hungry? Grab a Snickers. The original power bar. Chocolate, nougat, caramel, peanuts—it’s all right there and in great proportion. And, it gives your molars and jaw something to really get workin’ on. They aren’t kidding when they say Snickers really satisfies. 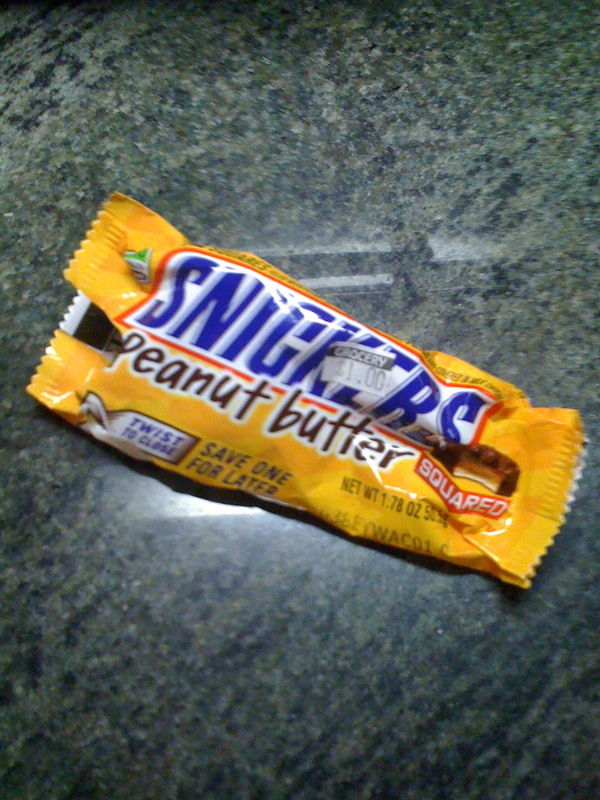 So, I’m thinking a peanut butter version of Snickers, let me have it, right? This is gonna be awesome. I LOVE peanut butter. It’s a dollar I’ll never get back. The nougat was too … too … what’s the word … whipped. More like a Musketeer than a Snickers. It didn’t have that Snickers nougat density. And was that nougat supposed to taste like peanut butter? Because that flavor hit me like bad cooking oil. Hello? Peanuts? Did you forget to jump in? Something had a crystalline texture to it. Was it the chocolate? The “caramel”? Whatever it was, I had a mouthful of tiny crystals. Like when you bit into some bad candy. Was that texture there on purpose? Who’d want that? There was no satisfying chew. My jaw was disappointed. It left me feeling heavy. Like I had just too much oil. Not a good feeling. As a life-long Snickers fan, I was looking for and expecting a Snickers with peanut butter. What I found was nothing like a Snickers. Take the name off it and call it something else, folks, and save your brand. That tweet convinced me get out of my sweats and into some real clothes after a snow day that shut down the City of Boston. I love the French-inspired menu – absolutely. But put a deal on it like 50% off and I’ll push old ladies over to … well, yeah, I guess I’m a bit of a frugal person. Boots on, Jennifer and I trudged through the gloppy banks of slush in the South End to SDLT’s Back Bay location. Fig Manhattan: fig-infused bourbon and sweet vermouth. 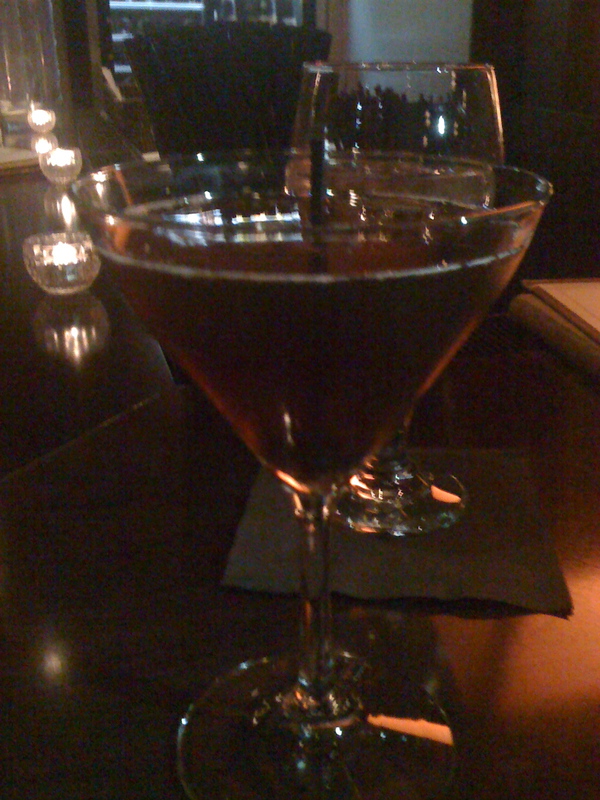 I’m a big Manhattan fan but drink them sparingly (can’t have as much of the hard stuff as I used to …). I made an exception for this savory-sweet version of the classic leather-chairs-and-wood-paneled cocktail. A half-dozen moon shoal oysters served with a garnish of red onion and … couldn’t really tell you. Maybe some champagne vinegar in there? Jennifer thought the oysters were terrific. Me? “Meh,” I think is the latest fashionable grunt for “not that impressed.” Maybe the tiny bits of oyster shell left in my mouth had something to do with it. I could have used another accompaniment option. Grilled flatbread pizza with smoked chicken, feta, caramelized onions, sautéed mushrooms and sage. That’s A LOT to put on a pizza that’s about 5 inches in diameter—and that’s only okay when the result is as AWESOME as this. One of the best flatbread restaurant pizzas we’ve had in quite some time. Was it lightly touched with balsamic vinegar? There was a sweet tang to the flavor that went nicely with the feta. Mmmmm feta …. love it on pizza. Big thumbs up on this plate. Panko crusted yellowfin tuna with citrus salad, honey and chili sauce. If you order this, bypass the chili sauce: 1) it’s way too hot and 2) it covers the natural flavor of a wonderful hunk of tuna and the nice touch of the somewhat spicy panko covering. Tuna was cooked perfectly – meaning barely at all. Panko played the perfect second fiddle. And the citrus salad – there were a couple of tiny hunks of red grapefruit I think but the real stars were the spattering of dried fruits. Love dried fruit in my salad. Lightly dressed with something – not sure what – again, it let the flavors of the salad and fruit come out big rather than weigh it down with oiliness. Bread basket and butter: An assortment of breads – all done well – came with a sweetened butter. Was that honey? There were little flecks of something in there – not sure what. If you know, please give me a shout out in the comments section and let me know. To me, sweetened butter belongs with brunch. On pancakes. You are currently browsing entries tagged with Dainty Rates at The Dainty Dot.